A beautiful sunset is always a pleasure to be savoured - but a medieval one? On a recent day trip to Northumberland, having visited the medieval castles of Alnwick, Bamburgh and Dunstanburgh earlier in the day, we had started heading inland for the journey back to Cumbria. We knew that Warworth was not too far away and because of its importance as a medieval castle (built in the 12th century), we decided to call in. It had been a sunny, cloudless though cold day and so it was that, without too much of a detour, we managed to get to Warkworth Castle in time to watch a glorious sunset. When we arrived there was no-one there - only us. Overhead the sky was still blue and the setting sun cast a glorious golden light onto the castle. We couldn't gain entrance as it was well past opening time but without anyone to disturb us we were able to walk around the perimeter and down to the river in the direction of the hermitage. I'll never forget the quiet of the early evening and how the only discernible movement around the castle was that of several black crows high up on top of the ruined walls; they were enjoying swooping down on the air currents and then back up again, clearly enjoying the last remnants of daylight before settling down to roost for the night. The scar left by this tragedy is the ghost that is said to haunt the castle and its grounds - the ghost of Sir Bertram himself. 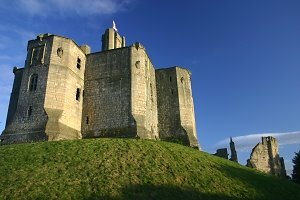 A more detailed account of the legend of Warkworth can be found on our web page: Haunted Warkworth Castle.